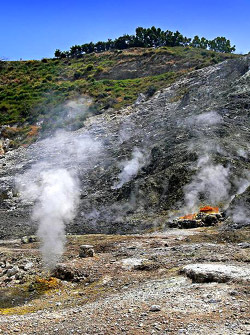 Solfatara is a shallow volcanic crater at Pozzuoli, near Naples, southern Italy; it is part of the Campi Flegrei volcanic area. It is a dormant volcano, which still emits jets of steam with sulphurous fumes. The name comes from the Latin, Sulpha terra, "land of sulphur", or "sulfur earth". It was formed around 4000 years ago and last erupted in 1198 with what was probably a phreatic eruption - an explosive steam-driven eruption caused when groundwater interacts with magma. The crater floor is a popular tourist attraction, as it has many fumaroles and mud pools. The area is well known for its bradyseism. The vapours have been used for medical purposes since Roman times.